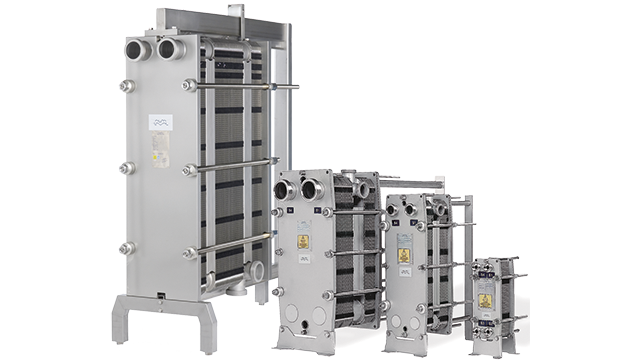 Alfa Laval BaseLine is a competitive range of gasketed plate-and-frame heat exchangers for simpler dairy, food, beverage, pharma and other hygienic and utility applications. See Alfa Laval Frontline for more demanding hygienic applications. Optimization of duties: BaseLine heat exchangers are available in four different sizes (Base 3, 6, 10 and 11) and work with various plate types to ensure optimal performance for your application. Chevron type plate pattern ensures good distribution of the product as well as high thermal efficiency and is used in a wide range of industries. Gemini double-wall plates ensure a fully mix-proof design. It consists of two plates pressed together and prevents cross contamination between fluids in case of leakage through the plates. The chocolate pattern distribution area ensures that the fluids are evenly distributed across the entire plate to avoid stagnant zones that can result in fouling. Channels are formed between the plates and the corner ports are arranged so that the two media flow through alternate channels. The heat is transferred through the plate between the channels, where the counter-current flow helps attain the highest possible efficiency. The corrugation of the plates provides the passage between the plates, supports each plate against the adjacent one and enhances the turbulence, resulting in efficient heat transfer. Our thermal design engineers will help you design and select the model and configuration that is suitable for your application needs while delivering maximum thermal performance and minimizing pressure drop. FrontLine is a premium range of hygienic heat exchangers used for heat sensitive media. ClipLine is a premium range of hygienic heat exchangers used for smaller duties. 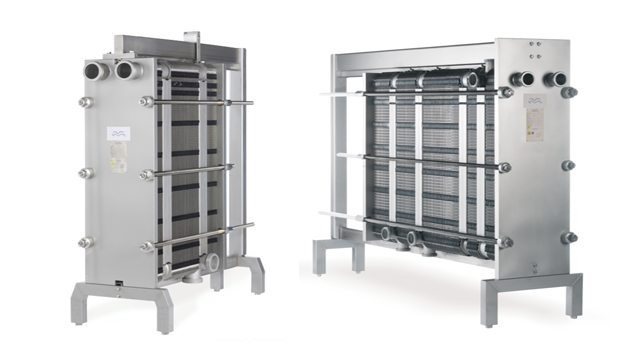 BaseLine is a competitive heat exchanger for a variety of hygienic processes and utility applications. 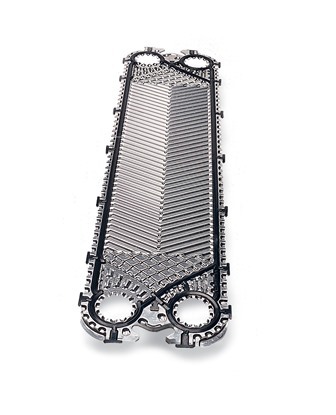 M line is a standard heat exchanger choice for a variety of applications where higher design pressure is required. Here are some tips and service videos to show you how you can keep your hygienic gasketed plate heat exchangers in tip top condition. Introducing the world’s most modern Gasketed plate heat exchangers. Discover how our next-generation line of gasketed plate heat exchangers will bring you higher efficiency, better reliability and greater serviceability. Alfa Laval's hygienic equipment combines high performance with gentle handling to preserve sensitive ingredients. Keeping up with the food industry trends and addressing four key challenges; supplying food products to consumers at a competitive price, getting the most from raw materials, reducing waste and emissions, and delivering safe and hygienic food products.